Karnak is a vast, ancient-Egyptian complex of chapels and temples, which includes the well-known temple of Amon. Due to long neglect, graffiti was allowed to flourish on the site’s many walls. 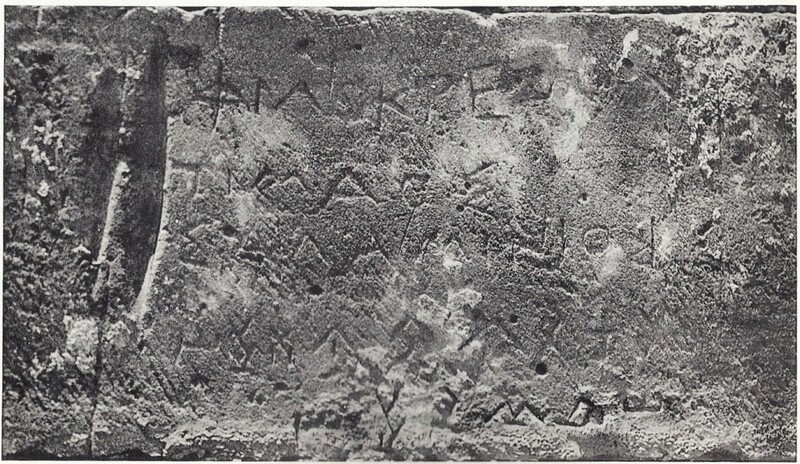 Located on the east wall of the temple of Achoris, ICS 427 is a digraph that includes both the alphabetic and the syllabic Greek versions of the message. Achoris was a pharaoh of the 29th Egyptian dynasty (399-380 BCE); this dating supports the belief that syllabic Greek was used between the eleventh and the fourth centuries BCE. Notes: While there is no obvious word separation between pi-lo-ke-re-wo and ti-ma-o-se, the alphabetic Greek offers guidance regarding transcription and translation. Moreover, Philokreon has interesting implications. If taken for its meaning, Philokreon “fond of meat” must be considered in light of Salamis. Cf. It. salami (from PIE *sal- “salt”), a class of insaccati “sausages”, which constituted a major staple of the Mediterranean diet. In context, Philokreon may have been a sausage vendor who managed to advertise at Karnak. Masson, Olivier. 1961. 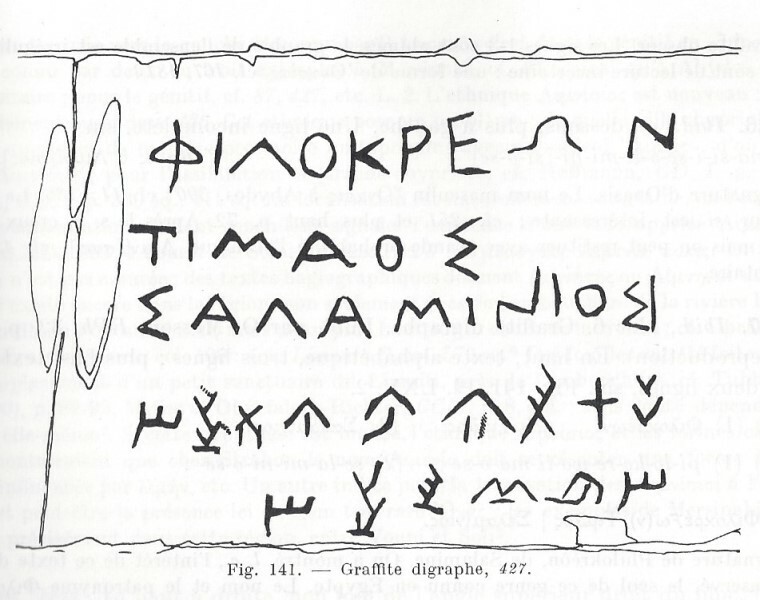 Inscriptions Chypriotes Syllabiques. Paris: E. de Boccard, p. 378 and Pl. LXV. Sausage Peddlers, Vagabonds, and Bandits: Part 1. Clifford A. Wright.com. Ret. on 30 Jun 2015.